Over the past few months, thanks to your generous donations, I’ve raised over $7,400 to fight Leukemia and Lymphoma in honor of my mother-in-law, Margie Griffin, who passed away from leukemia last August, and my friend Stacy Bowman, who is a leukemia survivor. I’m at 99% of my $7,500 goal; thank you for all your support. If you're interested in sponsoring me or learning what it's all about, check out my fundraising site at Steve's Team in Training Page Steve's Team in Training Page. I decided to take a tip from the riders in the Tour de France and see if I could find anything to work to my advantage. Not being up to speed on blood doping nor having access to EPO, I tried to gain an advantage through moderate and, I might add, legal means. In addition to the weeks of training, I did other things to help give me an extra edge before the event. I started drinking excessive volumes of water, combined with electrolyte supplements. I had two deep tissue massages to make sure every joint and muscle was loose and ready. I even set aside my male pride and *gasp* shaved my legs. We arrived at the start of the Death Ride at 4:45. With out much fanfare we were on the road at 5:15 and freezing. It was 44 degrees outside. After a chilly half hour the climbing began - so much for being cold. The forecast for the day was for it to reach 90 degrees with a chance of thunderstorms. 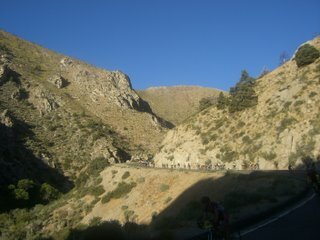 The first climb was up Monitor Pass. I made it to the top by 7am. This was great news since I expected to be there by 7:30. I flew down the other side of Monitor Pass, hitting a top speed of 48mph, heading to Nevada. On the way down I saw several of my teammates already heading back up. Knowing they had a 40 minute head start, I was hoping to catch them. Traveling the 8 miles to the bottom in 15 minutes, I refilled my water bottles and headed back up. I realized that the 8 miles down hill is a lot farther uphill. I made it to the top of Monitor again in an hour and 45 minutes. So far so good. I had a quick run to the bottom of Monitor and started up Ebbett’s Pass. I had told my friend Betty that I would be over Ebbett’s and down to the Hermit Valley between 11 and 1. If I wanted to make it by noon, I’d have to push a little harder. Pushing harder sounds like a reasonable plan, but putting it into practice is a bit different. Fortunately, about 7 miles from the top of Ebbett’s Pass they have a water station. At this rest stop all the volunteers are dressed in Hawaiian costumes. They were serving cold drinks and fruit. It was just what I needed to get me to the top. In my best Clydesdale fashion I slowly climbed to the top of the pass at 8700’. By now I was thinking I might have bitten off more than I can chew. I was passed by some guy pedaling a recumbent bike. Recumbents look more like a rolling chair than a bike. They’re generally ridden by granola eating, New Age listening, tie-dye wearing, hippie wannabes. I’m not a big fan. I descended into the Hermit Valley on the other side of Ebbetts. I made it by 12:15. 15 minutes behind schedule. 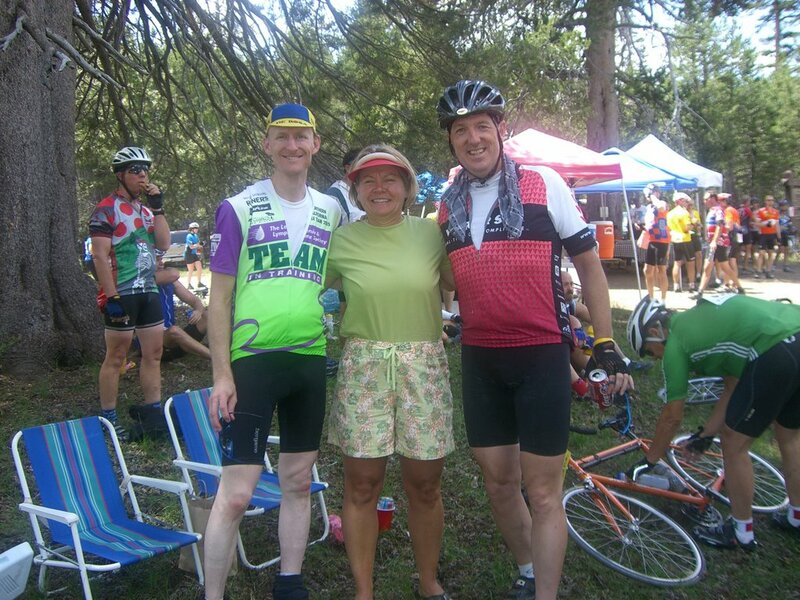 At the bottom, Betty Bennett and her husband Dennis were there to cheer on the riders. Betty is one of my sponsors and had lost a close friend to cancer. They drove over just to see the team and provide support. She provided good wishes and just as importantly, an ice cold soda and some ice for my water bottles. After some pictures and a soda, I waved goodbye and headed back up for the fourth pass. I started out great, but the heat and climbing were beginning to take their toll. About half way up, I had a stroke of good fortune. As I was riding along someone came alongside and said that they had heard of Virsa. (Virsa is the company I worked for and is one of my sponsors. In honor of their support I was wearing a Virsa jersey.) It turned out to be Dave Harris, a co-worker from my ActivCard days. Dave and I talked on the way back up to the top of Ebbett’s. It was the distraction I needed to not think about the climb. I made it the top of Ebbett’s by 1:30. After a quick refill of the bottles and a repair to one of my cleats, I was heading back for the last pass. I was starting to get a little pressed for time. I decided to skip the lunch stop and gain ground by pressing on to the last pass. To go up the last pass, you have to pass back through the starting point of the ride. A lot of people abandon the ride at that point. They realize that they’re in a lot of pain and would just as soon stop. Fortunately for me, I had some supporters that helped me along the way. As I was making my way to the last climb, my wife Sherri and my friend Scott were waiting at a turnout along the road. They had cold water, Red Bull’s, cokes, otter pops, and turkey sandwiches. Sherri also brought me a clean jersey, undershirt and socks. After close to 9 hours of riding, I looked like a salt lick. The change of clothes, refreshments and an opportunity to wash all the salt off gave me enough energy to make it to the next climb. I made it to the start of the next climb by 3:00pm. At the Death Ride the riders have to make it through checkpoints by certain times. If they don’t, they have to turn around and head back to the start. I figured I had an hour and a half to make it to the next checkpoint. It was going to be close. I started the climb to the last checkpoint and things started to turn worse. I hadn’t had any leg cramps all day. Now when I needed to make up some time, the legs decided to not cooperate. My speed dropped considerably. I was in serious doubt of making the cutoff time. After about 15 minutes of slow, slow pace, I heard someone say, “Steve and Alex are behind you”. Two of my TnT teammates had caught up with me and were now right behind. I let them pull ahead and I used the other Steve to set pace. Once again fate had smiled upon me. We pulled into the checkpoint at least 50 minutes before the cutoff time. 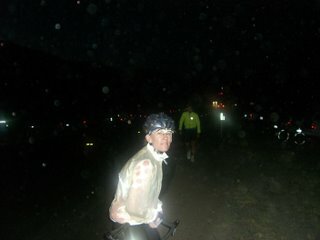 At the checkpoint, Scott and my wife were there with cold water and Red Bulls. Scott had filled the back liner of his truck with ice. I took advantage of the setup to soak my feet in the ice water. It was great therapy for hot swollen feet. Replenished and refreshed I climbed back on the bike to make the last 9 miles to the top of Carson Pass. As you know, I’m doing this ride to honor my mother-in-law, Margie Griffin. Margie was a kind and giving person. She knew I was a big fan of cycling in general and Lance Armstrong in particular. She went into the hospital last August with a lung infection. When she went into the hospital she said she had a gift for me and said she hoped it would arrive soon. Margie was in the hospital for several weeks and her condition steadily worsened. We went to the hospital to visit and she was heavily sedated with morphine. She was not expected to survive much longer. I was there with my family when my sister-in-law handed me the package that Margie had ordered for me. Margie had purchased a book that was a collection of all the articles that Sports Illustrated published about Lance Armstrong. It was a small but generous act that touched me deeply. As she lay there dying she still had thought of others. I was too choked up to mumble an intelligible thank you. Margie died the next morning. When I heard about Team in Training and the opportunity to raise money to fight blood cancers, I felt that it was a way to say thank you to Margie. I had 9 miles to go to the top. With a fistful of endurolytes, Advils, a couple power gels, some water, and a lot of determination, I covered the 9 miles in a little over an hour. It was the fastest I had climbed all day. As people were trudging along the side of the road, I was passing. I flew past several riders along the last half mile including a guy on a ridiculous recumbent bike – (I really don’t like those bikes). I crested the top and rolled to the last rest stop. I met several members of the TnT group. I’d finally caught the group that had left earlier. We waited for the last few TnT riders to come over the top. We had a celebratory ice cream, donned our jackets, and raced downhill to back to the start. Our best laid plans went slightly astray when on the way down it started to rain. A summer thunderstorm had formed from the hot weather. I quickly discovered the disadvantage of shaved legs. Water flows much more quickly down a smooth leg and straight into your shoes than a comparable hairy leg. The women on the team confirmed my assertion. With soggy socks and shoes, the team crossed the finish line as a group. 129 miles, 15000 feet of climbing, 13 hours on the bike and about 11,400 calories expended, we completed the Death Ride. Thanks to all of you that have supported me. It’s a great cause and every donation moves us closer to finding a cure and to helping the victims of blood cancers. Special thanks go to my sadistic coaches that trained us well. 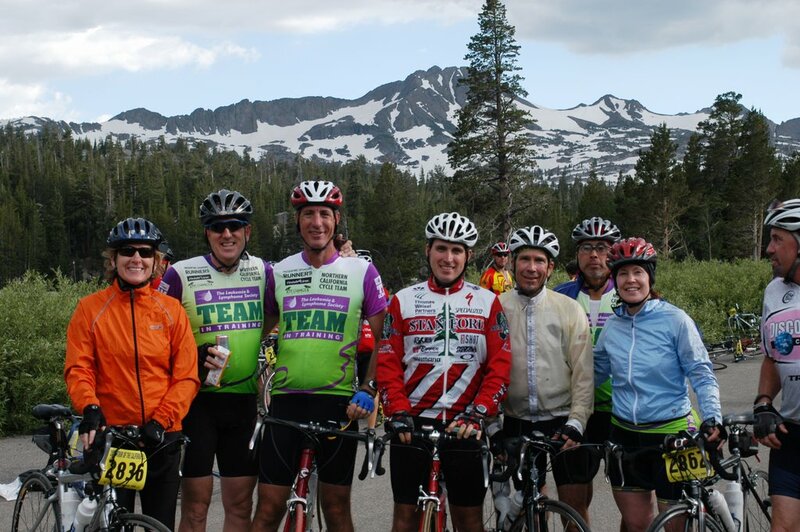 Thanks also go to the Sherri, Emily, Rob, Jimmy, Scott, and John that came out on training rides and the Death Ride to provide SAG support.